"Tennis Equipment. tennis trainer equipment. Oncourtoffcort Tennis. Training equipment. Tennis Caution Tape also fits in perfectly with the USTA 36/60 Quickstart programs designed to scale down tennis courts to the appropriate size of young children to speed up success in learning, improvement, and fun. Easily create 6 playing areas for 12 children in a single tennis court. Set up your tailgating area with ""Tennis Caution Tape""! Nobody will mistake you for anything other than a tennis caution tape. Raise the height of the net,practice shots with different arcs and depths! 'Tennis Caution Tape' - training aid allows coaches, parents, and kids to set up tennis nets everywhere. 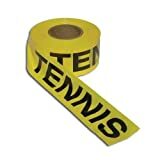 The bright yellow three-inch wide tape comes on a 1,000-foot roll and simply ties between fences, trees, chairs, or anything available to simulate a mini-tennis net."